The Altiplano (Spanish for high plain), in central South America, where the Andes are at their widest, is the most extensive area of high plateau on earth outside of Tibet. Lake Titicaca is its best known geographical feature. The Altiplano is an area of inland drainage (endorheism) lying in the central Andes, occupying parts of Chile , Argentina , Bolivia , Peru and Ecuador . Its height averages about 3,750 meters (12,300 feet) , slightly less than that of Tibet. Unlike the Tibetan Plateau , however, the Altiplano is dominated by massive active volcanoes of the Central Volcanic Zone to the west. The Atacama Desert , one of the driest areas on the whole planet, lies to the southwest of the Altiplano. In contrast, to the east lies the humid Amazon Rainforest. At the end of the Pleistocene epoch, the whole extent of the Altiplano was covered by the vast Lake Ballivián, the present remnants of which are Lake Titicaca , straddling the Peru/Bolivia border, and Poopó, a salt lake that extends south of Oruro, Bolivia . Salar de Uyuni , locally known as "Salar de Tunupa", as well as Salar de Coipasa are two large dry salt flats formed as well after the Altiplano paleolakes dried out. 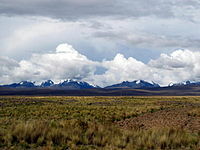 The term Altiplano is also sometimes used to identify the altitude zone itself — and the type of climate that prevails within it, colder than that of the tierra fria but not as cold as that of the tierra helada; the latter is usually reckoned as commencing at an elevation of approximately 4,500 meters (or about 15,000 feet). Alternate names used in place of altiplano in this context include puna and páramos. In extentum, the climate is cool and semi-arid to arid, with mean annual temperatures that vary from 3°C near the western mountain range to 12°C near Lake Titicaca , and total annual rainfalls that range between less than 200 mm to the south west to more than 800 mm near and over Lake Titicaca as well. The diurnal cycle of temperature, however, is very wide with maximum temperatures in the order of 12 to 24°C and minimum in the order of -20 to 10°C. The coldest temperatures occur in the southwestern portion of the Altiplano during the months of June and July, which correspond to the Austral winter. The seasonal cycle of rainfall is marked with the rainy season concentrating between December and March. The rest of the year tends to be very dry, cool, windy and sunny. Snowfall events may happen between April and September, especially to the north, but they are not very common (one to five events per year). La Paz , Bolivia is the Altiplano's principal city. Existence of weaknesses in the Earth's crust prior to tectonic shortening. Such weaknesses would cause the partition of tectonic deformation and uplift into eastern and western cordillera, leaving the necessary space for the formation of the altiplano basin. Magmatic processes rooted in the asthenosphere might have contributed to uplift the plateau. Climate has controlled the spatial distribution of erosion and sediment deposition, controlling the lubrication along the Nazca Plate subduction and hence influencing the transmission of tectonic forces into South America. Climate also determined the formation of internal drainage (endorheism) and sediment trapping within the Andes, potentially blocking tectonic deformation in the area between the two cordilleras.